Think tanks around the world are exploring these possibilities. In a Recent Report published by the McKinsey Global Institute, they delve into applying Artificial Intelligence (AI) for social good. While acknowledging that AI is not a silver bullet, they make the case that it could help tackle some of the world’s most challenging social problems. 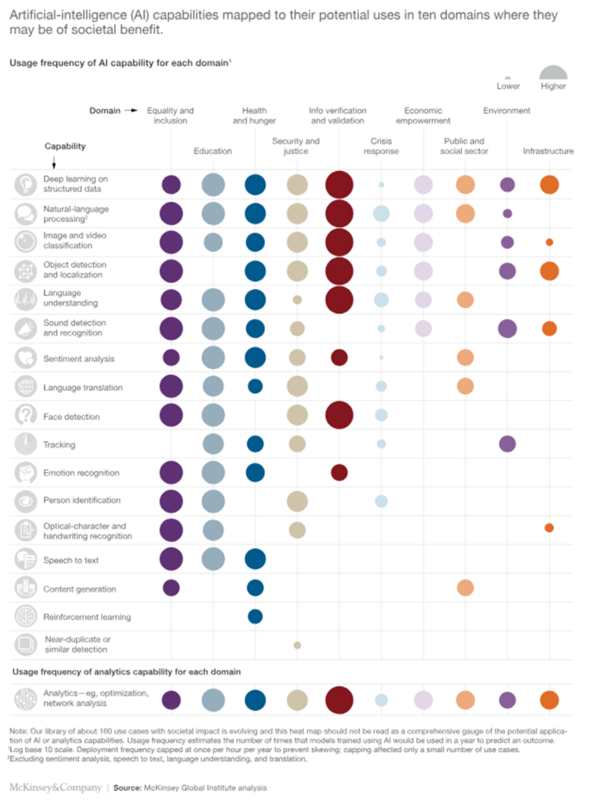 The team at McKinsey analyzed potential applications for social good and compiled a library of 160 AI social-impact use cases. Through this analysis, they suggest that existing AI capabilities could help across all seventeen sustainable-development goals, potentially helping hundreds of millions of people in both advanced and emerging countries. In the context of possibilities, they cite real-life examples being applied in one-third of these cases. Accomplishing these goals requires a shift to Purpose and Well-Being. The current profit motive in our shareholder value era is an obstacle to this shift. In the above referenced report, the authors point to several other obstacles that could undermine the realization of these goals (i.e., data accessibility, shortage of talent, and last-mile implementation). Above and beyond these obstacless are four main categories of risk identified by the report: bias and fairness, privacy, safety and security, and decision or prediction transparency. These obstacles have the potential to undermine progress, and many forces must converge to ensure that accelerating advancements enhance our humanity versus diminish it. As articulated when describing the Convergence theme, several catalysts drove human development during the first and second industrial revolutions. The human development potential of this next revolution is high – but what are the catalysts for convergence? The combination of science and technology represent one catalyst. A virtuous collaborative cycle is fueling scientific advancement at a rapid pace, while technological advancements help drive the cycle. This visual from the McKinsey report shows how technology – in this case AI – serves as a catalyst for social benefit. But science and technology alone cannot deliver these possibilities. 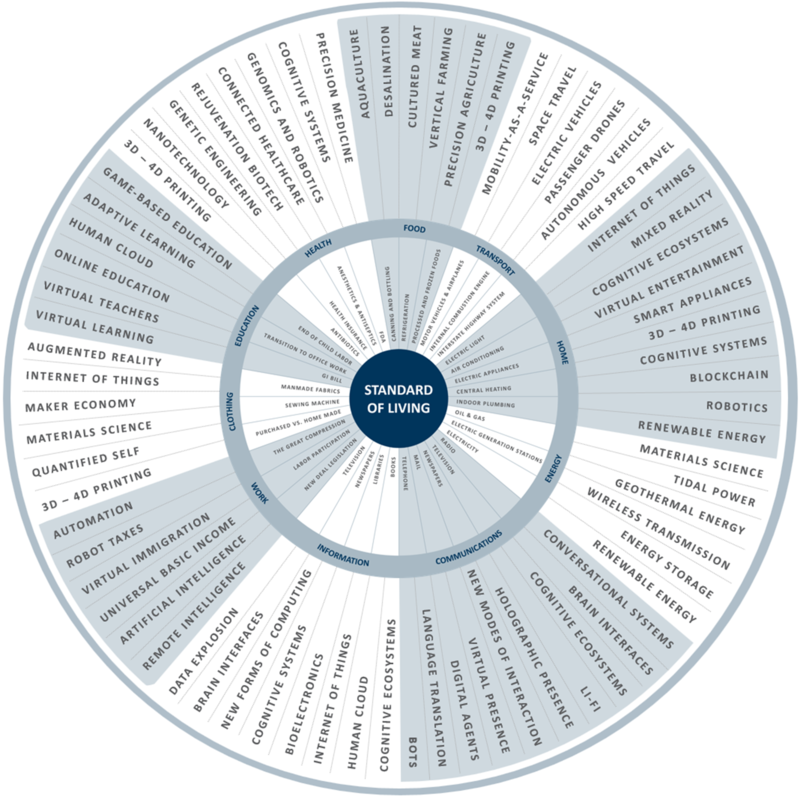 So much relies on the other domains in the convergence story: politics, economy, business, environment, ethics, and society. These three themes are synergistic and collectively help shape our future. The continued acceleration of innovation creates a burst of possibilities, while convergence serves to enable or gate realization. Acceleration is handling itself, but as a society, we must understand the possibilities and find the catalysts for convergence. Efforts like this from McKinsey help us to understand the possibilities. Dialog and awareness create a path to convergence. As the world comes together in Davos Switzerland, dialog and awareness around these domains of social good are occurring. Conversation like the one below continues – and I do believe 2019 represents a pivotal time for action. The best of global human development should be in front of us – not confined to a Special Century from our past.